As Glasgow School of Art assesses the damage after a fire severely damaged the Mackintosh Building library, artist and writer Elizabeth Grant reflects on the significance of the building and the institution. 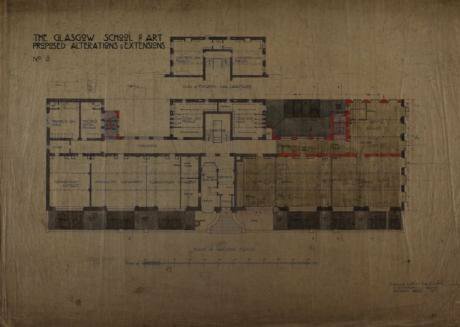 Studying in the Mackintosh Building of the Glasgow School of Art was a rarefied experience. At times it could feel otherworldly, like waking up inside of a waterglobe—you’re not quite sure how you got in, but it’s so magical, why disturb it by asking questions? Every piece of wood, every deep-set window with a space for students to sit, every number on every door was a considered expression of genius. Indeed, it was funny how often the elevator would break down. As one of the few significant components of the school not designed by Mackintosh, one felt inclined to wonder if its consistent failure to operate was not some sort of paranormal comment on its inelegant intrusion into Mackintosh’s design. 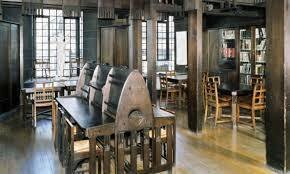 For the other parts were elegant in the extreme—the Mackintosh Building is / was a rarefied environment to nurture talent: conceived of not as a museum, but as a living, breathing environment to encourage inspired artistic production. 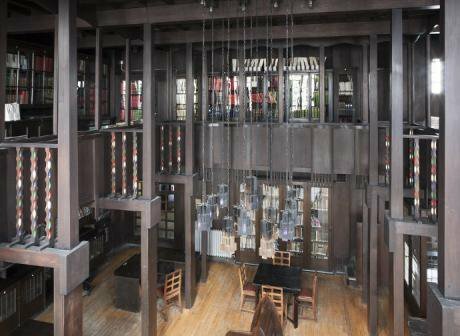 Mackintosh gave us everything: places to sit and think; light; air circulation; cosy corners to read or retreat from a difficult tutorial; and a glorious sun-lit catwalk where you could feel for a minute like you owned the city of Glasgow—itself a runway of dazzling architecture. It is a testament to the school’s administration that it has continued as a working art school—and was not sidelined for museological purposes alone. The presence of arts practitioners—both students and their tutors activates the building in a way no tour ever could. I first visited the school in the summer of 2011, having studied it in an architectural survey course during my undergraduate studies in Canada. I had to see the Mackintosh Building—it was the reason I came to Glasgow. The incredible atmosphere inside soon began to work on me—from my chat with Alison the lovely receptionist, to the dramatic way you moved from deepest shadow to glorious sun-lit views over Glasgow, this was a place worth paying international tuition fees to be a part of, if only for a while. I spent one wonderful, intense, magical, and sometimes punishing year there before completing the Masters of Letters in Fine Art Practice—my studio was on the top floor of the Mackintosh Building (where the old Interior Design studios were located) and I watched the new Reid Building go up. Among the few occupants of the school during summer, many of us de-camped in June of last year to the 4th year painting studios on the west side of the building: today I watched a live feed of photos and video online, showing flames surging from those same studio windows. The scope of the loss is staggering in its breadth: it ranges from the historic, to the deeply personal, to the potential of the artworks that were being installed there today by students who have worked four years to get to this moment, gone in fire. I dearly hope that counseling services will be made available to all. Four years is a long time when you’re 21. The period since the fire has been a difficult time for the Glasgow School of Art, and for all its people who have lost so much. In the Mackintosh Building Charles Rennie Mackintosh gave the people of Britain, and students of art and design an incredible gift. In such a moment of such loss, we must repay this gift with things that can’t be burned—love, loyalty, and dedication.